Ryan Reynolds is taking up the fight to bring more help to sick kids at one of the world’s largest children’s hospitals, and wants you to do the same. The Canadian actor, whose feature film credits range from 2002’s Van Wilder to 2016’s Deadpool, stars in a new ad from the Hospital for Sick Children in Toronto, colloquially known as SickKids Hospital. 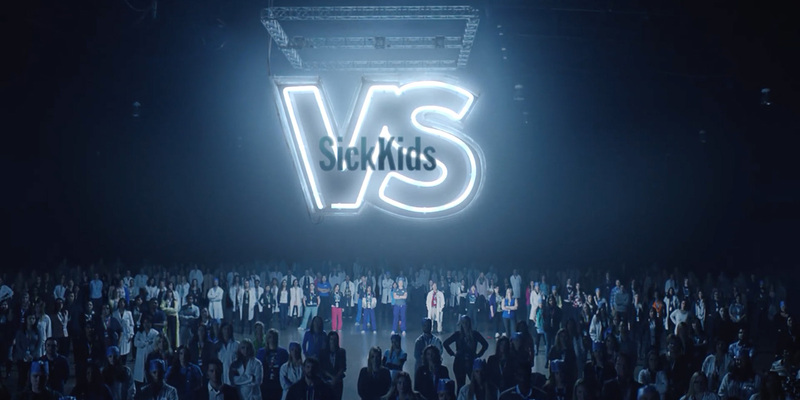 Part of the organization’s beautifully bellicose “SickKidsVS” campaign, the 45-second spot opens on a dark room, with a lone silhouette standing in the middle, shrouded in shadows. As the shot pans upward, a neon sign bearing the campaign’s logo flips on in the background, buzzing as it reveals some 300 staff members from the hospital, who volunteered for the shoot. “Join us,” Reynolds concludes. It’s not as irresistibly powerful as “Undeniable,” the two-minute anthem Cossette created to launch the campaign last year, or as totally heart-wrenching as the :90 it made for Mother’s Day this year. But the new ad, from the same agency, is certainly an attention-grabbing addition to the fundraising efforts of a worthwhile cause. The SickKids Foundation is collecting cash to build a new hospital—and calling it the largest fundraising campaign in Canada’s history. A spokesperson for Cossette, meanwhile, says Reynolds joined the campaign on his own initiative. If you doubt his sincerity, or need further convincing to pitch in, just watch the spot again, and pay extra attention to his eyebrows.